Choose the best time of the day to process requests, and Bleen will take care of notifying patients. 90% of Canadians say they want the ability to book medical appointments online. Here’s your chance to meet their needs. Avoid spending the day taking and returning calls by letting your patients book their own appointments online. Are you a patient searching for a clinic? 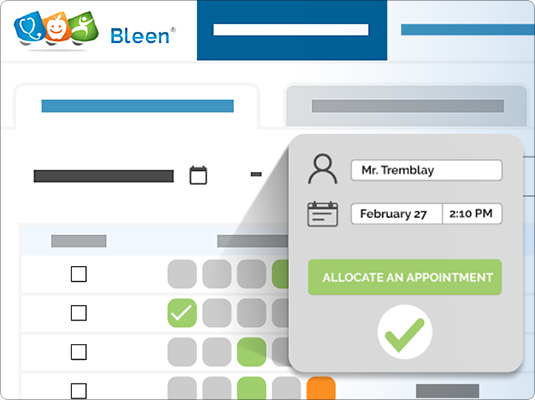 Allow your patients to request appointments online through Bleen®'s UNO platform. Manage them easily and efficiently and enjoy significant gains. Want to find out if Bleen® is right for you? Be the next clinic to eliminate lineups, confirmation calls, and reminders.